This month's Q&A features my former co-worker, Jess, with whom I've become great friends over the last three years. We worked in the same bean counting enterprise (on the same team to be exact!) before moving separate ways with our careers, but we've remained very close ever since. Besides bonding over our time in the treacherous bean counting trenches, we've also found common ground over fun things, such as our love for wine (especially enrolling in multiple classes at New York Vintners), fluffy flapjacks, BYOBs, and all things sweet. As you can see, she's been mentioned many a time on Four Tines, so I thought it'd be fantastic if I finally introduced her to you! She's always been there for me (in celebration and in cope), and I'm happy to have such a wonderful friend like her in my life. Thanks again to Jess for participating in this month's Q&A session! 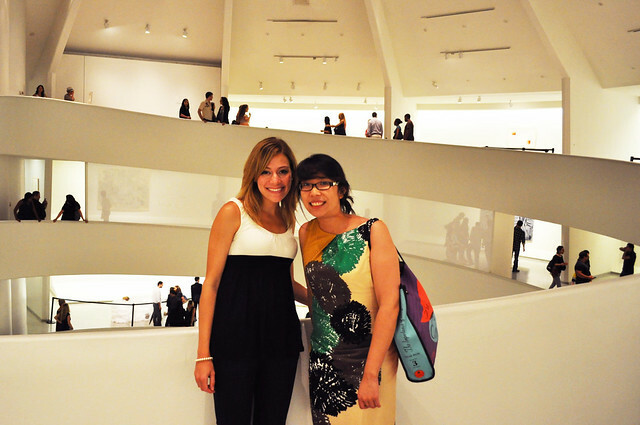 Jess and me at the Solomon R. Guggenheim Museum for Art After Dark: First Friday, July 2011. My "old" favorite is Beyoglu over in the Upper East Side for its Mediterranean cuisine -- best hummus ever! My "new" favorite, however, is Flex Mussels -- name says it all, as it offers over 24 varieties of mouthwatering mussels! My drink of choice is wine, which includes both reds and whites -- from Franzia (yes, I said Franzia!) to JAQK Cellars' High Roller, which I might add I had the pleasure of enjoying while in the company of Stefie (here and here)! Anything sweet -- I have an obsession. I can whip up one mean peanut butter and jelly sandwich! 365 Everyday "Crunchy Peanut Butter" from Whole Foods is key. France, for the bread, the cheese, the pastries! What more could one ask for? Honestly, anything my dad makes. He never follows a recipe. It is all from scratch and by taste! Food served cold -- i.e., any dish intended to be served warm that has clearly been sitting behind the scenes in the kitchen for a bit too long. The birthday cakes which are made by someone by the name of Mr. Kilmore. He owns a small catering business in my hometown of Carlisle, Pennsylvania. He has been making birthday cakes for my sisters and me for the past twenty years. The best birthday cakes of my life, no joke. The Clinton Street Baking Company Cookbook, which I received as a gift from Stefie. The recipe for the infamous Clinton Street pancakes was divulged in it, and I've conquered it many times already! I have prepared these fluffy flapjacks of joy on five separate occasions for different friends and family. Its sugar cured bacon recipe has also been a big hit! My reasoning: Really, the answer to this question took my mind to this word. In order to achieve the perfect “fluff” when it comes to those fluffy flapjacks of joy I just mentioned, I must carefully fold the batter!